Lots of scenic views along this trail. Temps started at 68 ended at 85, foggy then sunny, no wind then North wind. This is a summary of my day at the park separated into three sections for easy reference. This hike starts behind the Visitor Center and ends at the park entrance road approximately .35 miles away; return on said road for a total hike distance of about .7 mile. 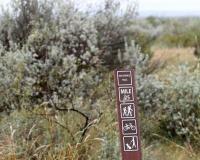 The hike meanders along a path filled with identification markers of various plants native to the park. There is a historical sign near the end of the hike regarding the old windmill (no longer functioning). Although it is relatively short, you will get a work out hiking up and down the hillside. This hike can only be done as a member of the park conducted guided tour ($ - check with the park as to dates and times). The total distance is about 1.2 miles although we were told it was 2 miles long. Leisurely hike as you learn about the Native American pictographs the park is known for. I recommend this tour and advise you to make sure you're wearing comfortable hiking shoes, bring water, and have a good camera! STRONGLY SUGGEST you get a free park trail map when you go to the Visitor's Center it's easy to read and most important, it's accurate! 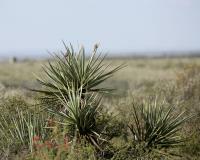 There are no trees in the park but lots of scrub and various cactus which means you will be hiking in the open - an important factor in the summer months. These trails can be hiked separately or combined (I suggest you combine the hikes totaling approx 8 miles). 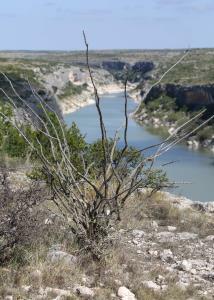 Both hikes start at the Rio Grande Trailhead; the Canyon Rim Trail branches off approx .45 miles in (according to the park trail map). Of the two trails, the Rio Grande Trail is the easiest as you are hiking on a crushed stone/dirt road along the western edge of the park. Both trails are well marked with mileage markers about every .25 mile. Where there is a junction with another trail, it is clearly marked. I followed the Rio Grande trail until it headed for the Panther Cave Overlook; I continued straight and connected to Canyon Rim Trail. Continue straight and you'll come to the Rio Grande Viewing Area - Mexico is directly across the river. I stayed on the Canyon Rim Trail as I headed North which took me to the Panther Cave Pictograph site. Panther Cave is one of the park highlights and well worth the effort to see it. Understand that you cannot go to Panther Cave but view it from the viewpoint across the canyon (there is a boat tour available at certain times of the year but I have no direct knowledge of the cost or when it is offered). A word of advice - look to the right of the Pather Cave Overlook shelter/info kiosk and you'll see a trail that goes along the edge of the cliff (not listed on the map). Follow the trail, always making sure you stay safe, and at some point you'll have a direct view across the canyon to see inside the cave with the pictographs. Continue on the Canyon Rim trail and eventually it connects to the Rio Grande Trail - very easy to see on the trails map. Of the two trails, Canyon Rim is the most scenic and more arduous with many portions of the trail being rock, either loose or one single piece, with inclines and declines of some length but it is do-able. Since there is NO WATER available on the trails, make sure you have plenty before leaving the trailhead and be advised, there is NO SHADE on the trails except at the few viewing areas which are clearly marked on the park's trails map. GET A FREE TRAILS MAP at the Visitor Center!!! NO WATER on the trails - make sure you bring plenty. Water, shade, info and toilets available at the Visitor Center.